Another innovative urban farm is in Denver, this time fully centered around cultivating community. Metro Caring is partnering with Saint Joseph Hospital to bring a Freight Farm to the Mile High City, thanks to a donation from the Morgridge Foundation. This hydroponic garden has the capacity to grow the equivalent of two acres on 10 gallons of water a day, all in a refurbished freight train car. 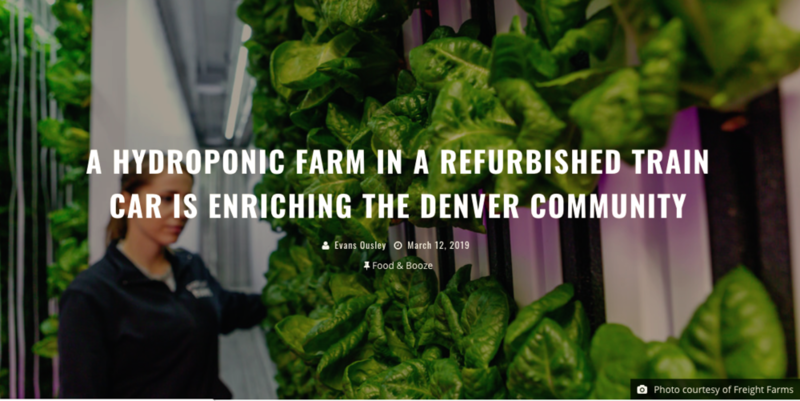 While Freight Farms are now utilizing urban spaces across the country, having a farm inside an old train car is particularly fitting for Denver. It’s marrying two Colorado traditions: farming and railroads, as a consequence of the mining culture. In addition to the new Freight Farm, Metro Caring has a few other garden spaces in the Five Points and Capitol Hill neighborhoods. Last year, the organization turned over the care of those gardens to their participants and their community, giving them control to choose what they wanted to grow and cook. “The gardens really came alive, we saw that our participants, volunteers and staff were gardening side by side,” Seinicki commented. For that reason, participants will also help make decisions in operating the Freight Farm. Though the freight car is small, hydroponic growing utilizes space more efficiently than a traditional soil far. In a contained space, farmers are able to provide the ideal conditions for growing – controlling the light, humidity, temperature, CO2 levels and many additional factors that affect growth. Because the plants are given exactly what they need to thrive, they are able to grow faster in their vertical towers than they could on land. In the span of about eight weeks, the Freight Farm will harvest two acres worth of greens – around 500 to 600 plants – packed with nutrients and fresh flavor. Metro Caring’s chief gardener, Jess Harper, will oversee the farm’s operations. “It’s so fascinating that you can engineer it to have all of the things that your little plants need to grow and be nutrient-dense,” she commented. Harper will be with the plants from seed to harvest, ensuring that the freight car’s environment perfectly suits the plants in all stage of growth. The process begins in the germination trays where seeds grow in a plug of peat moss. They sit under a set of lights that emulate day and night and are sprayed with water and nutrients until they sprout. Then the seedlings are moved to a pool-like container that floods from the bottom. This allows the roots to soak up water and other nutrients without disturbing the growth up top. After seedlings grow to about two inches, the gardeners will move the plants to the vertical towers that hang from the ceiling and allow water to flow down to the roots of each plant. Along the rows of towers also hang LED full-spectrum lights that are a concentrated form of everything plants need for photosynthesis. Once the greens reach harvest size, Harper and a team of Metro Caring’s community will remove each plant – with roots attached – from the vertical towers. This lettuce will stay fresh for about two weeks with the root ball attached. Harper is excited to provide greens that will stay fresh three to five times longer than what you could buy in the grocery store. “This is the freshest lettuce that you’ll find [in the area],” she commented. The Freight Farms is incredible, not only because it grows fresh and nutrient-dense greens, but also because it is a sustainable method of farming compared to traditional customs. The container itself reduces waste by refurbishing a train car that was headed for the trash. Inside, the hydroponic system uses less water than a soil farm. Because the Freight Farm doesn’t use soil, none of the water is soaked up and unable to be utilized by the plants. The water that does evaporate into the air is removed by a dehumidifier and put back into the tank after being filtered. The LED lights used to nourish the plants uses significantly less energy than standard grow lights. While the farm does take a lot of energy to run, Metro Caring and Saint Joseph Hospital are considering solar power in the future if they have the funding. The hydroponic system also requires very little space to function, so the Freight Farm takes a small amount of space – a few parking spots – compared to two acres of good farmland. All in all, hydroponic growing in a space with great technology to record data is a great alternative when growing in urban areas. Metro Caring is clearly excited to be experimenting in this new age of urban growing. Sienicki commented that the Freight Farm “allows us to be a part of a growing movement in the food world around sustainable, urban, local agriculture.” But while Metro Caring’s is excited about giving their participants a chance to participate in the food movement, their partnership with Manual High School is equally as important. Students from the Career Readiness program will come to help out at the farm and learn the science behind hydroponic growing. Metro Caring’s work in teaching a future generation to rethink traditional farming and explore the opportunities in urban farming will be so important for the future of urban growing. In addition to their work on the farm, Manual students will work with a team at Saint Joseph Hospital to discuss the importance of healthy eating and nutrition. This work supports the great work Metro Caring does in teaching their participants about nutrition. As in all of Metro Caring’s work, the Freight Farm is centered around community and providing the resources necessary to help each member of the community thrive. Giving participants a space to grow their own food is a big part of Metro Caring’s mission in fostering a community. “One of our core beliefs is to allow our participants and our community to co-create with us,” Sienicki commented.With over 40 languages represented by participants, there are so many people from different cultures and cuisines at Metro Caring. Part of Sienicki’s excitement in turning ownership of the garden spaces over to participants was allowing them to grow foods from their various heritages that they couldn’t find in the grocery stores. In making this change, Sienicki also learned that some of Metro Caring’s participants had a background in farming and growing their own food. One woman, in particular, grew up helping her grandparents on their sharecropping farm. It wasn’t until she began gardening with Metro Caring that she was able to grow her own food again and has now been teaching her own granddaughter how to grow vegetables. “She was so excited to have access to land and to get her hands in the dirt again because she hadn’t been able to do that since she was a kid,” Sienicki explained. Metro Caring’s Freight Farm is located at 819 Lafayette St., Denver. Contact Teva Sienicki or Jess Harper for more information about the growing process here .